UPDATE: A new version is now being developed and has been granted US Patent # 10,045,513. 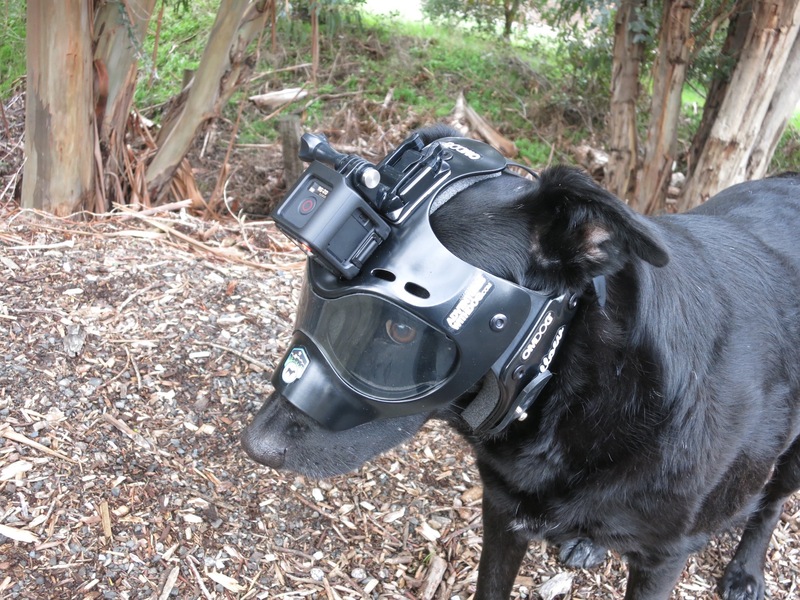 Introducing the latest design, the Trident Helmet, tailored for Belgian Malinois and German Shepherds. When one that fits Willow’s head is produced we will take it into the field on our next adventure and subject it to our tried and true test procedure which is Willow wearing it and chasing some critters over hill and dale, through brush and bramble and generally beating the crap out of it. If it survives Willow’s enthusiasms it will hold up anywhere. We have written before about Willow helping out some friends of ours by being a “head model” for their upcoming line of protective canine headgear. After numerous fittings, adjustments and revisions we are thrilled to finally have our own copy. 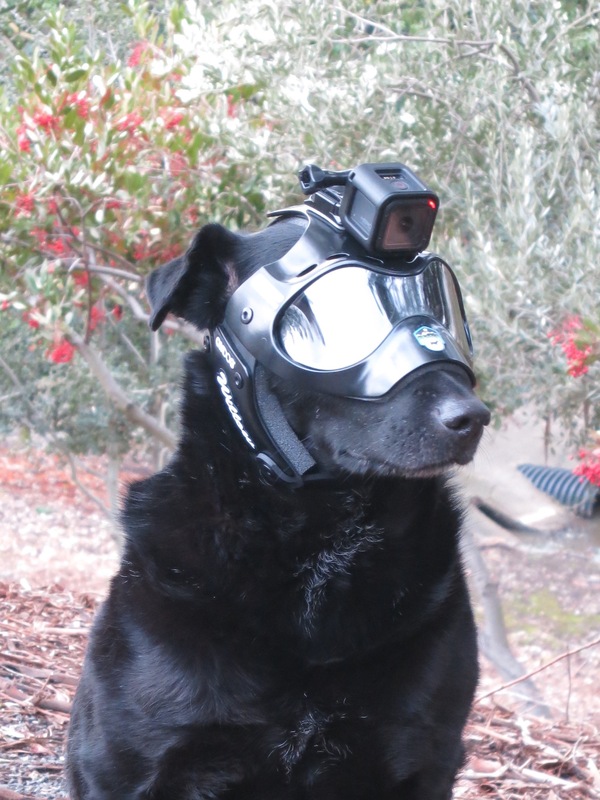 She can now romp with abandon, chase critters under hill and dale while protecting her eyes and face and tackle her doggie friends without fear of high-speed skull-on-skull contact. All those and more fun possibilities all while protecting her little Princess Pea Brain and being a platform for our GoPro Session camera. We went to pick it up the other day and were treated to this advanced prototype that her head was a big part of during the development process. It incorporates a new, dual-paddle design back strap which allows for a snug fit, helps position the nose area of the helmet flush with her snout while still being comfortable for my girl and not prone to do damage to her neck or spinal cord in the event of a traumatic head collision. The general idea for this was originally designed for a disabled dog who was having seizures and regularly falling over and hitting his head. Sadly, before the prototyping process was completed he took a turn for the worse and had to be put down. From those early design sketches, mock-ups, models and hand-made molds came this well thought out advanced prototype. Several of the early versions of the back strap allowed too much anterior/posterior movement which created gaps either in the snout or neck regions. The second generation design solved that issue but was in direct contact with a portion of her spinal area and might have done damage in the event of a substantial impact to the helmet. The third version made short work of that issue but was too close to a cartilaginous area of her ears and would have rubbed too much. Finally we now have the fourth version which uses that aforementioned dual-paddle design back strap and is snug and comfortable. The lens snaps into the frame and is removable so that we can quickly install a clear or tinted version depending on the environment we are playing in. We have been promised that later versions of the lens will be available in an optically correct curvature with options for various coatings including anti-scratch, anti-fog and those cool, colorful coatings you see on Oakley-style sports lenses. This exact helmet was used for the 3D scanning process which resulted in editable CAD files. With those in hand the helmet can be scaled up by various ratios to meet the sizing needs of any dog breed and head shape. 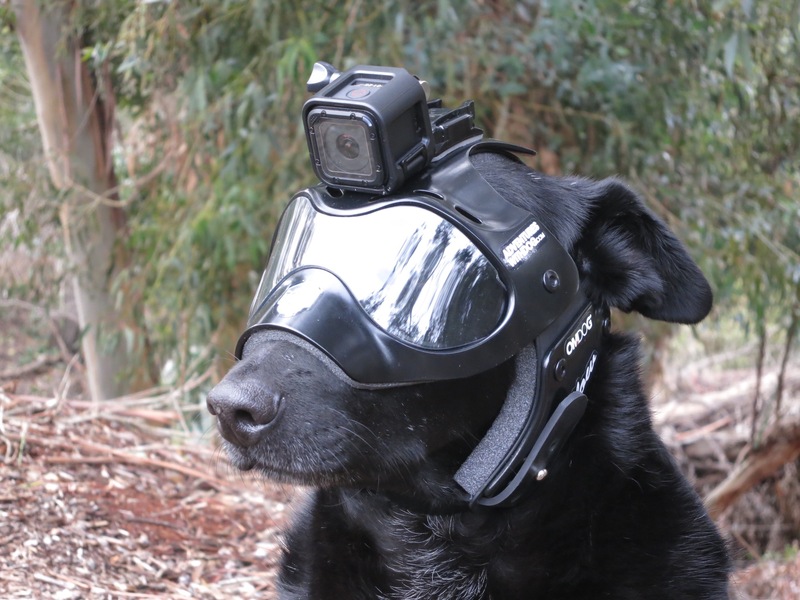 The next step is to produce these via a 3D printing process using a variety of materials and colors depending on the needs of the individual dog and mission. That process should also allow both the weight and the price to come down so that a wider variety of dog caretakers will be able to afford such effective protection for their furry loved ones. The design of this helmet is now officially Patent Pending. It is protected by a utility patent on the way the head gear functions, as opposed to a design patent on the aesthetic appearance. Utility patents are much stronger than design patents, more difficult to obtain, and therefore more desirable. We are looking forward to seeing the upcoming 3D printed versions and what we expect to be wide-spread adoption in working dogs, active companion animals as well as hard playing adventure dogs such as Willow. For more information please visit our new website www.k9helm.com.